Princeton Center works with many companies involved in the Food, Beverage and Flavors Sector. Within this sector, we frequently work with those in the operations or quality assurance / control departments. It is people in these positions that can most appreciate what we offer. In the food manufacturing / processing industry the specification of standard operating procedures for equipment is very important. In some cases this is critical, sinse much of the large-scale equipment is no longer manufactured and therefore the maintenance procedures are critical to guarantee sustained performance. The Nabisco Foods Group technical center was looking for manufacturing procedures software because it needed to standardize the information and support of products created for a wide variety of in-house clients. The technical center supports products, sales, operations, maintenance, and engineering. The Nabisco Foods Group was looking for a simple way to generate programs rapidly maintaining consistently high quality and found it with the ExpressTrain Manufacturing Standard Operating Procedure Software. We worked closely with Nabisco’s technical center to establish an internal factory process. Nabisco Foods Group licensed ExpressTrain Manufacturing Standard Operating Procedure Software to allow the technical center to rapidly and efficiently respond to the many demands regarding its manufacturing procedures. 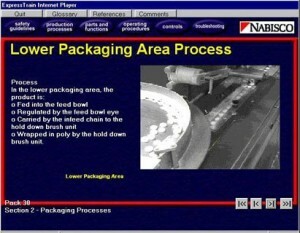 At Nabisco Food Group, ExpressTrain formats (web-based training, job aids, performance checklists, etc.) made it easier to follow standard maintenance procedures and keep the operation working at high capacity performance. Nabisco was able to save over $500,000.00 on development in one year.